"Dunkerry, or the Grand Cave...can only be entered by water. The entrance is tolerably regular, and somewhat resembles a Gothic arch. 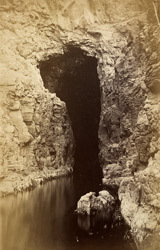 Perhaps the most peculiar circumstance connected with this cave is the rising of the water within, in response to the swell of the ocean, which, upon this coast, is at all times heavy; and, as each successive wave rolls into the cave, the surface rises so slowly and awfully that a nervous person would be apprehensive of a ceaseless increase in the elevation of the waters until they reached the summit of the cave. Of this, however, there need not be the most distant apprehension, the roof being sixty feet above the high-water mark. Many prefer the echo of this cave to that of Portcoon."